The Oysterponds School District is proposing a spending increase of $24,373 — or .43 percent — in its 2017-18 school budget. The district plans to raise the tax levy by .48 percent to stay under the tax cap. That translates to an increase of 18 cents per $100 of assessed value. An average home assessed at $6,000 would have an estimated increase of $10.82, according to a district budget brochure. The Oysterponds school board has adopted a $5.6 million budget carrying a 1.9 percent spending increase over the current year. Oysterponds Elementary School officials are describing a recent state audit of the district’s finances as a positive experience. The new report found the district has maintained an excessive fund balance over the last four fiscal years. The Oysterponds school board is expected to adopt Superintendent Richard Malone’s proposed $5.5 million spending plan for the 2014-15 school year and two ballot propositions for windows and to establish a capital reserve fund at Tuesday night’s budget workshop, according to the agenda. The Oysterponds school board didn’t take any action on a veterans tax exemption program Tuesday night and decided to reopen the discussion in the spring, meaning the exemption will not be in effect for this year. KATHARINE SCHROEDER FILE PHOTO | The Oysterponds school board meeting is at 6 p.m. on Tuesday. The Oysterponds school board is expected to hold a public hearing Tuesday night to discuss a new property tax exemption for veterans, according to the meeting’s agenda. 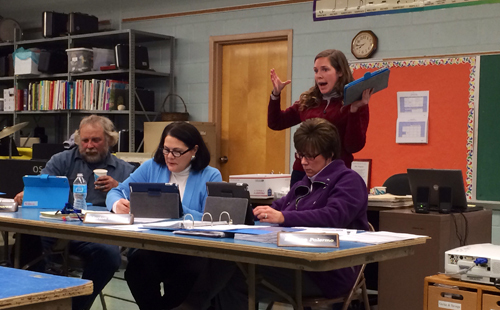 RACHEL YOUNG PHOTO | Oysterponds teacher assistant Brittany Knote, standing, gives a technology demonstration to school board members Tuesday evening. The Oysterponds school board is expected to vote on contract extensions for Superintendent Richard Malone and principal Joan Frisicano at Tuesday night’s regular meeting. Mr. Malone’s contract is set to expire this summer. He was hired in July 2012 to replace Ms. Frisicano after she resigned as superintendent. About a year later, the district hired her again in June to replace outgoing principal Françoise Wittenburg. If the extensions are approved, Mr. Malone’s contract will expire June 30, 2016 and Ms. Frisicano’s contract will end June 30, 2015, according to the meeting’s agenda. Both agreements carry an annual 1.5 percent salary increase. Tuesday night’s meeting starts at 6 p.m. due to tonight’s inclement weather, according to the district’s website. Scroll down to view the complete agenda. Check back for an update.